You know, Spidey and Twizzlers have a lot in common when you think about it. They both have a lot of red, they're both awesome, and now you can win cool stuff with them on Facebook. How does a trip to the set of the next Spider-Man movie sound? It's just one of the awesome prizes that you can take home if you point your browser over to Facebook.com/Twizzlers. 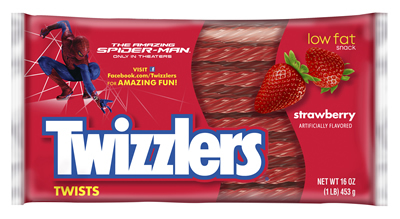 Once you're there, just add a Twizzlers 'twist' to Spidey's web and tag it in three different scenes from the upcoming Amazing Spider-Man movie. That's it- and you can win some really Amazing stuff. Those are some very solid prizes, no? It seems well worth the few seconds it takes to visit the candy company's page at any rate, with the chance to take that haul away. The Amazing Spider-Man (which re-boots Peter Parker's movie adventures, and looks fantastic by the way) slings its web at theaters on July 3rd.